Search online master’s degrees in our database so that you keep working while you advance your career. Until now, there was not a complete, unbiased source of information about online master’s degrees. This made shopping for the right degree very difficult and time-consuming. The Online Degree Database is built by educational professionals who collect data directly from program websites, including information that research has established is most important to students. This includes program curriculum details like available concentrations / specializations, total program tuition, location and US News & World Report ranking of the university, prerequisite and admissions requirements, and more. This information is organized into a searchable, online database that allows students to look for programs that meet their specific needs and download the program details that they need to make an informed decision. The information may be purchased at a nominal fee, saving prospective students time and ensuring they select from the universe of available programs, not just the ones that are marketing their programs heavily. Where Is The Online Degree Tuition? Over the past three years, I’ve spent a good deal of time researching online degree tuition and other key characteristics of online programs for competitive analyses. Our database of online degree program information (www.onlinedegreedatabase.com) currently holds details for over 4,200 online programs from more than 900 U.S. institutions. This makes it, by far, the most comprehensive information available about online degree programs in the U.S. market today. The new 2018-2019 tuition is now posted on university websites for most programs. I’m in the process of updating these details for all of the records in our database. My search for online program details replicates how a student would shop for an online program. This means that I’m in a unique position to offer some insights about online program website strengths and weaknesses. In my experience, the greatest weakness is that tuition / cost per credit of these programs is often the most difficult item to find. And yet, it is one of the most important considerations for students who are shopping for an online program. There are often no references or links to tuition / cost information on the program websites. Only a few programs have clear, easy to find information about their overall price on their websites. A few clever programs hide their tuition costs at the bottom of the landing page, under a tiny link called “Program Details”. Many websites link to outdated tuition or to pages that no longer exist (the dreaded “404” error). In some cases, the tuition and fee information provided on the university website is so complicated that it is nearly impossible for an outsider (and prospective student) to interpret. In-state vs. out-of-state costs, multiple add-on fees with acronyms that make no sense to someone outside of the university, all different for each school or division, undergraduate vs. graduate, multiple campuses, total tuition numbers without clarifying the number of credits each represents. Any or all of this information may or may not apply to an online program vs a campus-based program. And, even in late August 2018, many programs still have the tuition tables for the 2017-2018 academic year on their websites (too many with 2016-2017!). And many provide tuition data without referencing the academic year to which it applies. To make matters even worse, many websites demure their discussion of cost to information about how to ‘fund’ education costs. Here they introduce their process for helping students get loans and scholarships. As a consumer, I always get a little worried when someone offers me financing options before I even know the total cost. And online students have told us that they are experiencing buyer’s remorse in part because they had not completed enough research on tuition and fees before enrolling in their online program. It’s time for online program websites to step up to this challenge. Students who are comparison shopping will move on to other online programs if they can’t get the information they need to make an informed decision. There are definitely more online program websites with improved content this year vs. the previous two years. But there are also many more online programs in the market, as competition continues to intensify. Gathering detailed online degree program information takes hours, if not weeks, of time scanning university websites. This is why the Online Degree Database exists. We collect details from university websites for the universe of most popular online master’s degrees like the MBA, MPA, MPH, MHA, MSW, MSN and more. And we’ve significantly increased the number of online information systems master’s degrees and bachelor degree programs in our database over the past year. Our interactive tool allows prospective students to work with the degree information in the database to find the best online programs using the criteria that are important to them. Plus, we give prospective students helpful information on thinking through what program characteristics are most important and tips for how to talk with online program advisers for the most popular master’s degrees. Visit our website today to see what we have to offer. Let us do the heavy-lifting on web-surfing university program websites for you! If you work at a university, let the Online Degree Database help you find your most competitive price and program characteristics. Contact michelle@onlinedegreedatabase.com for more information on our market intelligence reports today! These data are sourced directly from university online program websites and stored in a relational database. We update all records several times a year. We strive to include the universe of online programs from the most popular degrees in the U.S. today. We have also designed a student-friendly interactive tool that allows students searching for online degree programs to access our data — for free! Unlike other websites that target researching students to generate leads for online degree programs, our website never asks for student’s personal contact information. Students can access our available programs here to start their research on program options. They can select criteria like total tuition, location, or accreditation based on what’s most important to them. And they can generate an unlimited number of Free Reports that identify the universities offering online programs that fit their criteria. Our Free Reports contain the university name, degree name, and hot link to the program website so that the student can go immediately to get more information on the programs of interest directly from the university. When a university decides to sponsor their online degree program with us, we’ll provide more of their program details to researching students in their Free Reports. When a university chooses to partner with us, they are letting students know 1) that they are confident in the quality of their online programs, and 2) they want to provide students with the best information possible as they make one of the most expensive and important decisions in their lives. Our comprehensive database, interactive search tool, and Free Reports create a win-win situation for both students looking for their best online degree options and universities with competitive online degree programs. For students, we provide free access to the most comprehensive details about online degree programs available — and, for universities, we generate greater visibility for their programs based on program characteristics, not on existing brand strength or size of marketing budget (which may have nothing to do with the true quality of the online program from a student’s POV). The tables included here are based on details from Free Reports generated during the last seventeen days (April 1 to 17th, 2018). During this short period of time, we’ve had 33 visitors who generated a total of 87 Free Reports. Please note that students must use the interactive tool to select no more than 100 programs for each report. It should be no surprise that the M.B.A. and Ed.D. are among the most popular searches by visitors to our website. As traffic continues to build, we see interest in other programs growing as well. Students who find us and generate Free Reports are definitely taking advantage of the depth and breadth of our data to ensure that they understand and research all of the online programs that meet their criteria. The following table shows ALL of the universities that have earned visibility with researching students because their programs met some criteria that students were searching for when they generated their Free Reports, April 1 to 17th, 2018. Some of these universities invest heavily in marketing their programs, while others simply do not have the marketing expertise or budget to generate significant visibility for their programs. But does a student really care about the size of an online program’s marketing budget? I don’t think so. I think students care a good deal more about the quality and cost of an online program. 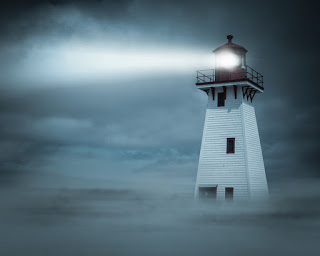 And a tool like ours, that let’s them complete due-diligence searching among all of their options, is a great step forward from what’s been available in the past. These tables demonstrate a very small part of the power of our database and reporting tools, all of which become available to our clients, when they become partners. As the tables above demonstrate, the Online Degree Database is bringing new and important information to the market about online degree programs. For the first time, researching students can access these details with our easy-to-use tools that allow them to select online program options based on program characteristics that are most important to them. Universities that fit the student’s profile appear, at no cost, in the Free Reports. The Free Reports contain a link to the university’s program website. Universities that wish to improve their online degree program visibility to prospective students by offering more details to students should consider partnering with us. See our recent press release to get more information about this. Or contact Michelle directly at michelle@onlinedegreedatabase.com to learn more about how we can help you improve your online program visibility. Visit the Online Degree Database today! Start your search for online Master of Accounting programs now! If you are searching for the most affordable online Master of Accounting degrees, look no further! We have researched ALL of the available programs in the market to create our recommended list. Other websites only include the programs that they market. We know that finding the right online master of accounting program is a daunting task. With more than 91 of these online programs in the market today, prospective students spend hours, even weeks, of time researching and looking for their best program option. We carefully collect the information published on each institution’s website for the 2017-2018 school year* and select those programs with characteristics that are most important to you. skip the time and effort of studying for and taking the GMAT exam, so you can move more quickly to meet your career goals! Here are the programs on our list again, but this time we also include the online program page hyperlinks to make it easy for you to check out the details of these programs on your own! As noted in the table at the top of this post, all programs noted here are professionally accredited. Clarion University of Pennsylvania is accredited by AACSB. The other nine programs are accredited by ACBSP. Liberty University and Maryville University of Saint Louis are nationally ranked by U.S. News & World Report’s Best Colleges Ranking. The remaining programs are at regionally ranked and unranked institutions. Eight programs charge a unified rate of tuition, which means it costs the same for in-state and out-of-state students to attend the online program. The lowest total tuition is at Liberty University ($18,450). However, if you live in New Hampshire and qualify for in-state tuition rates, then the program at Plymouth State University is your lowest cost option ($16,560) on this list. Colorado Technical University ($28,080) is number ten on our list. More details on the admissions criteria for each of these programs are also presented in the table above. All programs require you to send transcripts from any institution of higher-education that you’ve attended. Most require applicants to pay an application fee, provide letters of recommendation, resumes, and statements of purpose. And most require a minimum GPA for applicants earned during their undergraduate education. Only a few require applicants to complete an interview with an admissions representative or complete essays. What makes our Top Ten list special? No other website offers you an unbiased list of online programs based on information from the universe of available programs. In fact, if you use other published lists to start searching for the right online Master of Accounting program, you might overlook some very good programs! See my post with a recent evaluation of this here. 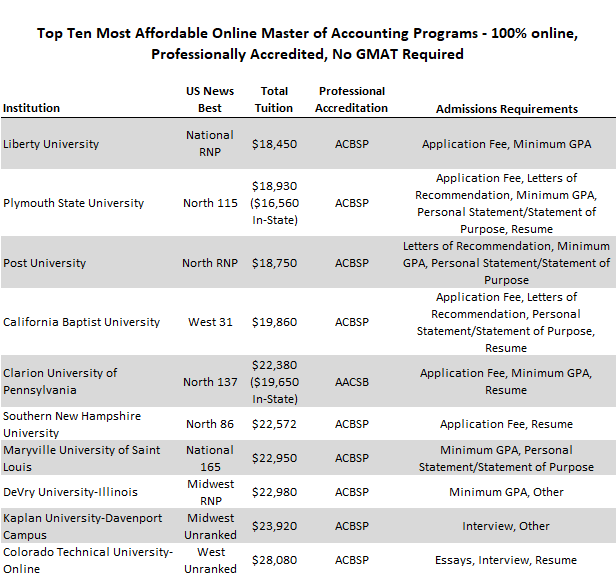 The Top Ten lowest total tuition online Master of Accounting programs, overall, are included in that post. We are the best source of accurate, comprehensive, and free information for searching online degree programs. We have over 3,900 online degree programs from more than 900 institutions in our database. Develop an accurate list of online degree programs using the criteria that are most important to you. Visit our Available Programs page, and select online degree programs by degree type, tuition range, professional accreditation, GMAT requirement, location, and more. Our reports are FREE to you. Generate as many reports as you like. We never ask for your contact information because we are not a marketing firm looking to sell leads, unlike other search websites. Search for your best program options for online Master of Accounting, MBA, Master of Analytics, Master of Data Science, Master of Science in Nursing, Master of Social Work, Master of Public Health, and many more of the most popular, career advancing programs. We also have details for online bachelor’s degrees in Business, Criminal Justice, Nursing, Social Work, and more! We believe that students researching online degree options deserve accurate, unbiased information about online degree programs! And we believe that there are some truly great online degree programs that might not get the visibility that other programs do because they don’t have a large advertising budget. *The Online Degree Database is not a marketing firm. Our goal is to provide prospective students with unbiased information about online programs from the universe of programs available in the market for free.